3 Nov 2014: The challenge has been solved! 9 Oct 2014: the room for Marc's guest lecture about bitcoin is: CWI L0.17. 8 Oct 2014: assigned exam topics. Detailed schedule coming soon. See here for the 2011 edition and here for the 2012 edition of this course. If time allows, we will cover more advanced cryptographic notions such as secret sharing, bit commitment, zero-knowledge and multi-party computation. This is a 6 ECTS course, which comes to roughly 20 hours of work per week. There will be homework exercises every week, handed out (and put online) after the Monday lecture, to be handed in one week later before the start of the lecture on Monday. Please note that also if you send the homework via email the same deadline applies. Our goal is to hand you back the corrected exercises in the exercise hour on the following Thursday. The answers should be in English. Feel free to use LaTeX, here is a template to get you started, but readable handwritten solutions are fine, too. Cooperation while solving the exercises is allowed and encouraged, but everyone has to hand in their own solution set in their own words. The final exam consists of student presentations about slightly more advanced cryptologic topcis. The detailed procedure and list of topics can be found here. The final grade for the course consists by 1/2 of the average homework grade (ignoring the worst grade) and 1/2 of the grade obtained at the final exam. Questions about the material are always welcome and can be addresse to Christian or Malvin. At the end of the second lecture, this crypto challenge was handed out. On Sun, 2 November, Eli has won the challenge! Congratulations! 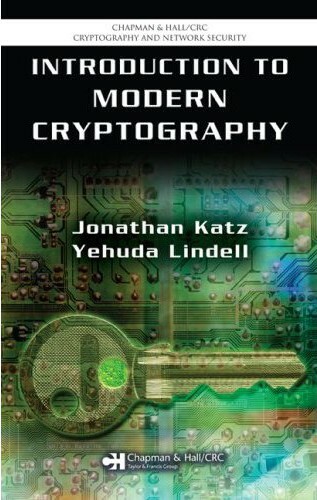 The first two videos give a short overview of the fascinating field of cryptography. The third is a recap of some historic schemes, similar to those seen in the first lecture on Monday. The last two give a crash course on discrete probability as we will need it in the course. Check out this wikibook for a quick summary of discrete probability theory. The exercise session from 11:00-13:00 is taking place as scheduled. Malvin will be there to work through some exercises related to the watched videos, and answer all your burning questions. As preparation for this lecture, you should know what a Turing-machine is, and familiarize yourself with the notion of probabilistic polynomial time computation (read Section 3.1.2 of [KL]). The according slides are available in powerpoint and PDF format. It is a mandatory part of Homework #4 to watch these lectures and submit two types of questions before Wednesday, 24 September 2014, 14:00. A good read: New Directions in Cryptography by Whitfield Diffie and Martin Hellman, 1976. Thu, 16 Oct There is no lecture today. The time will be used for talking about final presentations. Please select one of the time slots here and come to Chris' office (SP107, F2.41) at the time you picked. The last exercise session will take place (at SP904, A1.20) but start 10 minutes late. If you are not handing in via email, please bring your homework to Malvin at F2.26 in SP107. Join a Privacy Cafe in order to get your computer hardware up to speed. On 7 November 2014, there will be Privacy Cafe in the Brainwave bar at the Science Park.